Welcome to Gifted Geek and our top 5 office chairs. The team here at HQ spend hours and hours working at a desk so we know all about the importance of choosing the best office chair. The undeniable truth is that by using the wrong chair, you will be negatively affecting your health. The most common side effect of using a bad chair is lower back pain, hunching and shoulder aches. If your chair doesn’t provide you with adequate support, these short-term pains and discomfort can lead to long-term problems. It is a well-known fact that the wrong chair can lead to discomfort, distractions and a dip in performance. Any business, large or small, can increase the productivity of its workers by choosing the right type of chair that provides comfort, support and can be adjusted to suit the individual’s needs. Padding and cushioning provide comfort and support but too much can leave the body hot, clammy and sweaty which can lead to significant discomfort. To keep the user cool, many manufacturers use meshes or holes in the back of the chair to provide ventilation. If you’re the type of person that sweats easily and feels discomfort when it’s warm, consider a well-vented chair. Lumbar support refers to the shape and design of the chair back. Get it right and you’ll keep you back upright and straight. Get it wrong and after years of sitting at a desk, you’ll have lower back pain and a curvature of the back. Those using their pc to play games may want to consider a fully reclining chair, while others may want to slightly tilt it to a preferred position. Look out for reclining and tilt options on chairs, more specifically, look at full range of the adjustment. The height adjustment should also be considered, especially if you’re very tall or short. Leather is a popular material, it’s more expensive but should last longer and is easier to clean. Fabric is more common and cheaper, but tears easily and is more difficult to clean. Also, consider the feet, some castors are noisy and will scratch the floor surface, others are made from softer plastics and rubber, are quieter and won’t damage the floor. Below you’ll find five of the best office chairs you can buy today. We’ve got a chair for everyone, so whether you want support, padding, ventilation or require something fully adjustable, check out our recommendations below. Here are our top two favourite office chairs. The first is our preferred option for those that require extra padding. The second is also perfect for comfort. 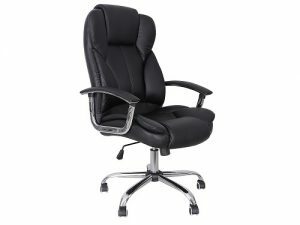 This is an executive office chair that has a recline function. With it, one can independently adjust the back of the seat and lock it in the preferred tilted position. It is made of leather upholstery and comes in black, brown and cream shades. Its arms are also padded to maximise comfort while sitting. Like most office seats, Cherry Tree padded chair can be adjusted height-wise with a 360° swivel top. When it comes to dimensions, the seat back is 75cm in height and 53cm in width. Looking at the seat height dimension, measuring from the floor or ground to the top of the seat back is 112cm but can go as high as 122cm when adjusted. Its base width is 55cm, and base depth is 53cm. Both seat depth and width are 50cm and has 18kg in weight. It is packaged flatly but very easy to assemble. The Songmics tilt office chair is an executive computer chair with a radian body type. Its height is 115cm, but that is adjustable up to 125cm. Seat back is about 76cm in height and depth and width are 50cm by 55cm. When it comes to seat height from its surface to the floor or ground, it is from 47cm to 57cm, depending on adjustability. It also swivels with the ability to rotate 360 degrees and shake back and forth. Its armrest is padded to enhance comfort. The best thing about the Songmics tilt office chair is its assured durability and stability. Its high safety and fittings are tested and confirmed safe by BIFMA. With a five-star foot diameter of 70cm, SGS confirms its stability to be reliable after testing it. This chair can take up to 150 kilograms of load, making it suitable for many body sizes. The chair’s PU material is of high quality with unique wheels that are quiet. These wheels also favour different floor types, including ceramic tiles, PVC, wooden floors and even floor rugs. The GT Force reclining seat is designed to offer high performance and luxurious comfort with its body-hugging presence. Its frame is highly durable, and it is made of faux leather that contains a high-density form that enhances its level of comfort during a sitting. Since the manufacturers took a keen interest in posture, this GT Force can recline to 170 degrees. One can also adjust it height-wise and lock it after finding the favourable height or angle. As if not enough, the manufacturer has given the chair one of the unique features that an office chair would have- an extendable footrest. To fully enjoy this seat, recline it and extend the footrest as well and enjoy luxurious comfort. It is fire retardant and has wheels that glide quietly and smoothly on floors, making it hard to scratch hard floors like those made of wood. If it is comfortable enough for gaming, then it is ten times more comfortable for an office setting. This ergonomically designed office chair is fully certified by BIFMA, assuring users of comfort and long-term use safety. It supports a weight of up to 285 pounds, making it suitable for different body sizes. In addition, it is explosion-proof feature seals the deal, not forgetting the sturdy legs that give it maximum stability. 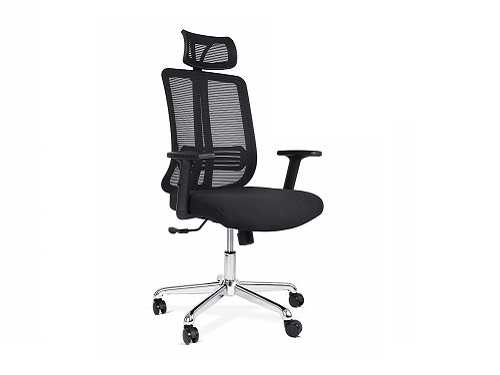 This executive mesh high backed chair is fully adjustable with simple nomadic controls that allow a user to alter its height and make the back recline. This is helpful mostly when spending long hours working. It is swivel and has a heavy duty nylon base, nylon armrest, meshed backrest, dual wheel casters that are favourable for different floor types, and best of all, it is made of fire retardant foam. With the seat pad also covered with the mesh, it ensures 24/7 ventilation. The backrest size is 455 millimetres wide by 575 millimetres high. 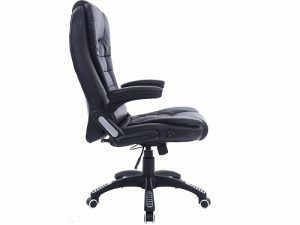 This is one of the most affordable, yet comfortable and reliable office chairs that one can purchase. It is not enormous, and so, saves a lot of office space. 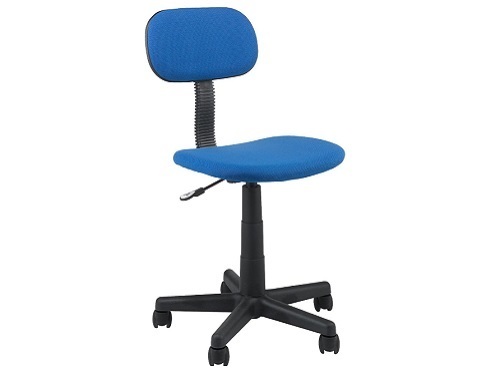 This chair is adjustable in height from 39.5cm to 51.5cm and of 360 degrees swivel. Its diameter is of 39 centimetres and width is 42 centimetres. It can handle a user weight of 110 kilograms at maximum, but the seat itself weighs about 5.6 kilograms. Its simple design is often perfect for a guest seat but can be used as a boss seat for small office settings. It is very budget friendly compared to other executive office seats and has simple features. It is also easy to assemble and long lasting when carefully used. A floor protection mat is an excellent product for those of you with wooden or laminate flooring. This material will prevent scratches and damage to the floor and also reduces noise from the caster wheels, this is ideal if you’re using the chair upstairs and noise is transferring through the floor into the rooms below. This mat measures 120cm x 90cm, is made from polycarbonate and is scratch, scruff and tear resistant. 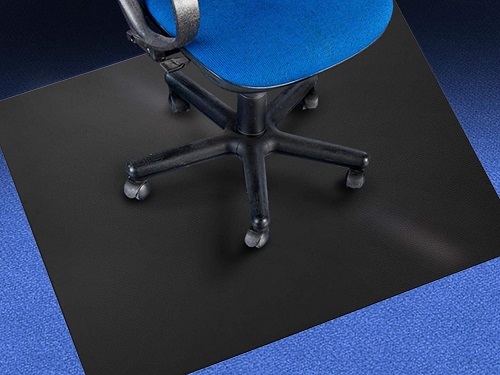 For large work areas, consider the bigger mat which measures 120cm x 150cm. The team here at Gifted Geek have chosen these five office chairs independently. 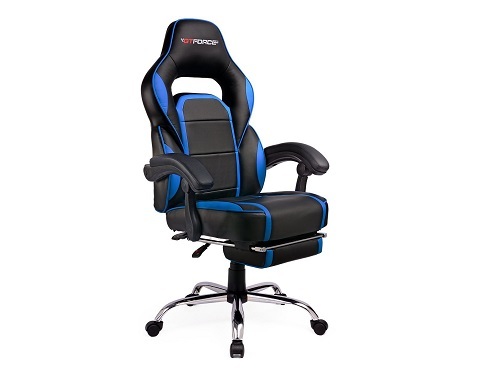 We selected the best chairs for comfort, extra padding, gaming, keeping cool and price.